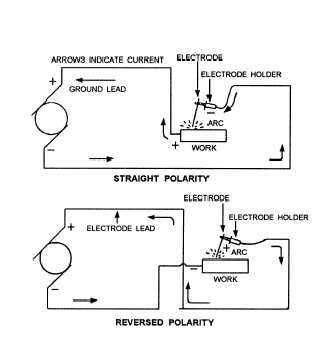 Figure 7-9.-Straight and reverse polarity in electric welding. On some of the older machines, polarity is changed by switching cables. On many of the newer machines, the polarity can be changed by turning a switch on the machine. Polarity affects the amount of heat going into the base metal. By changing polarity, you can direct the amount of heat to where it is needed. When you use straight polarity, the majority of the heat is directed toward the workpiece. When you use reverse polarity, the heat is concentrated on the electrode. In some welding situations, it is desirable to have more heat on the workpiece because of its size and the need for more heat to melt the base metal than the electrode; therefore, when making large heavy deposits, you should use STRAIGHT POLARITY. On the other hand, in overhead welding it is necessary to rapidly freeze the filler metal so the force of gravity will not cause it to fall. When you use REVERSE POLARITY, less heat is concentrated at the workpiece. This allows the filler metal to cool faster, giving it greater holding power. Cast-iron arc welding is another good example of the need to keep the workpiece cool; reverse polarity permits the deposits from the electrode to be applied rapidly while preventing overheating in the base metal. Figure 7-10.-Striking or brushing method of starting the arc. opposite is true and the greatest heat is produced on the negative side. Electrode coatings affect the heat conditions differently. One type of heavy coating may provide the most desirable heat balance with straight polarity, while another type of coating on the same electrode may provide a more desirable heat balance with reverse polarity. Reverse polarity is used in the welding of nonferrous metals, such as aluminum, bronze, Monel, and nickel. Reverse polarity is also used with some types of electrodes for making vertical and overhead welds. You can recognize the proper polarity for a given electrode by the sharp, crackling sound of the arc. The wrong polarity causes the arc to emit a hissing sound, and the welding bead is difficult to control. One disadvantage of direct-current welding is "arc blow." 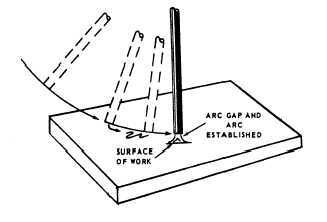 As stated earlier, arc blow causes the arc to wander while you are welding in corners on heavy metal or when using large-coated electrodes. Direct current flowing through the electrode, workpiece, and ground clamp generates a magnetic field around each of these units. This field can cause the arc to deviate from the intended path. The arc is usually deflected forward or backward along the line of travel and may cause excessive spatter and incomplete fusion. It also has the tendency to pull atmospheric gases into the arc, resulting in porosity. Arc blow can often be corrected by one of the following methods: by changing the position of the ground clamp, by welding away from the ground clamp, or by changing the position of the workpiece.